LIFE OF AGONY lead singer Mina Caputo and guitarist Joseph Zampella (a.k.a. Joey Z) paid tribute to late STONE TEMPLE PILOTS singer Scott Weiland by performing a stripped-down cover version of the STP classic "Plush" during LOA's December 6 concert at the Starland Ballroom in Sayreville, New Jersey. Fan-filmed video footage of their rendition can be seen below. Weiland was found dead on his tour bus on December 3 at the age of 48. The suspected cause of death is cardiac arrest, although an official report has yet to be released. A small amount of cocaine was found on the bus and Tommy Black, bassist for Scott's band THE WILDABOUTS, was arrested for possession. Both of Scott's former bands, STONE TEMPLE PILOTS and VELVET REVOLVER, issued statements on his passing, while musicians and fans around the world have also posted tributes. 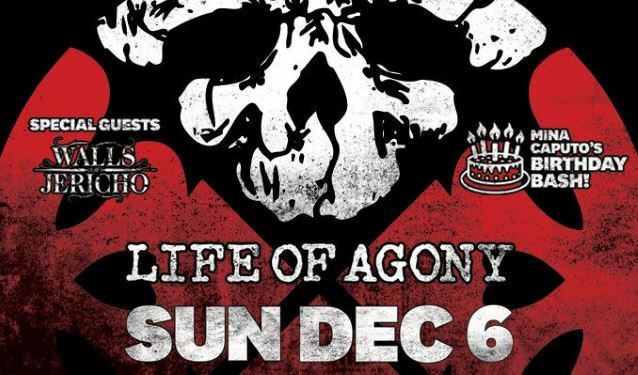 LIFE OF AGONY has played sporadic shows after completing its successful touring cycle for the 2005 Epic Records release, "Broken Valley". 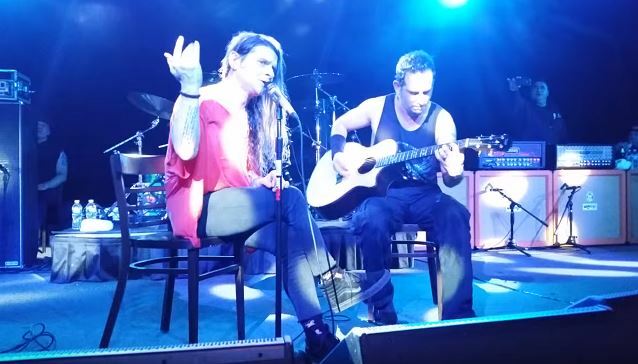 During an interview at this summer's Graspop Metal Meeting in Belgium, Mina Caputo (formerly known as Keith Caputo), who came out as transgender in 2011, was asked if there are any plans for LIFE OF AGONY to release new music. She said: "We can't predict the unseen. We have spoken about some stuff. We're shooting around some ideas, but [there's] nothing solid at the moment. But we may pop out with a song or two. We're not one hundred percent sure. We're having a great time. [There's] no pressure. We're getting offers from so many different kinds of companies and labels that just wanna throw money at us. But we're just, like… We don't even know if we wanna be with a label. We're tired of it. We make our money. We do all of these big shows in between the festivals. We're selling out. We don't need tour support. We don't need anybody."